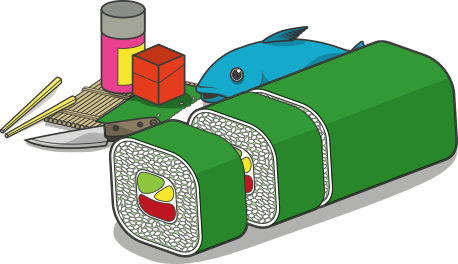 Who says sushi is not for vegetarians or vegans? 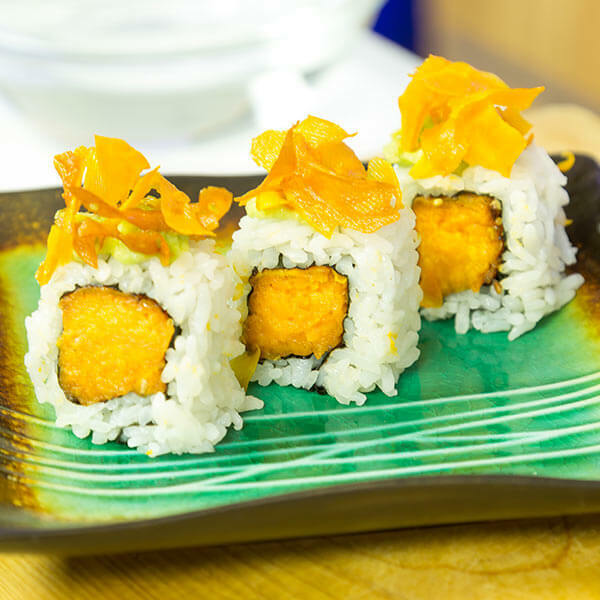 Chef Devaux helps you make a delicious sweet potato sushi roll. Peel a sweet potato and cut off a thin slice on both sides, to get a flat surface. You need to end up with a number of square rods. Cut the potato lengthwise in slices of 2 cm thick, and cut these slices in ‘logs’ of 2 cm thick. Cut of the edges if they’re not flat already. Keep the excess parts of the potato, you’ll need them later. Put the ‘potato logs’ on a baking tray, add some toasted sesame oil and turn over the potato pieces, to cover them in oil on all sides. Season with some sea salt, black pepper, onion powder, a little bit of garlic powder and some sesame seeds. If you prefer spicy, also add a bit of cayenne pepper. Turn the potato logs over a few times to let the seasoning stick on all sides. Bake the potatoes in the oven on 180 ˚C (356 ˚F) for 1 hour and 10 to 20 minutes. Turn them over a few times while baking. They’re ready when they’re crispy, golden brown on the outside and soft and tender on the inside. Using the peeler, cut thin slices from the left-over potato slices. Deep fry the slices on 170 ˚C (338 ˚F). 30 to 40 seconds of frying should be enough. Put the slices on a paper tower, season with a bit of sea salt and let them dry. Place half a sheet of nori with the shiny side down on a rolling mat. Spread 100 g of cooked and seasoned sushi rice evenly over the nori. Flip it over and place two baked potato logs lengthwise to each other on the side closest to you. Roll the mat until it seals the potato sushi roll. Apply pressure with your hands, lift the mat a bit and roll it forward until the role is sealed again. Remove the mat and place it on top of the potato sushi roll. Gently tap on each side to tuck in the sides of the roll. Cut the roll in half, using a very sharp knife. Cut each half in half again, and do the same with each quart. Now you have 8 pieces of potato sushi! Separate the pieces and put them on a plate or serving tray. Add a little bit of avocado-lemon-salt mash on top. This is very simple to make: put some avocado pieces, lemon juice and sea salt in a bowl and mash with a fork. Use a piping bag or simply a teaspoon to put the mash on top of the sushi pieces. Take the deep-fried potato slices and crush them with your fingers. Place a bit of the crushed potato on each sushi piece. This not only looks great, it adds a nice, crispy sensation to your potato sushi. Done! May 18, 2012 Vegetarian "Bejiterian"